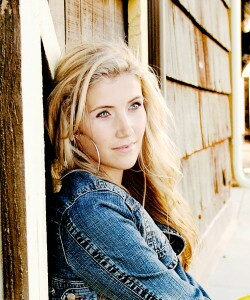 Briette Peterson was born and raised in San Diego, California, where she thrived on singing, sports, and dance. She was blessed to be born the last of eight children and thoroughly enjoyed singing publicly with all six of her sisters throughout her life. Her large, talented family provided an atmosphere where her love of music was able to flourish. Briette started participating in recording sessions, at the age of 16, that captured her delight from the moment she put on her first headset. Her studio involvements eventually lead her to begin recording her own Debut Album, release 2011. Additionally, to her delight, she was selected to be a featured vocalist on the album, “An Angel to Watch Over Me,” produced by Covenant. The Album is a musical tribute to mothers and features, “I’ve Waited All My Life For This,” one of the songs on her debut album. She married Brett Peterson in May of 2004. Brett and Briette make their home in Murrieta, California, where they love making memories with their 4 children, Makissa, Kashmin, Rockstin and Truly. In August of 2006 Briette graduated with a bachelor’s degree from Brigham Young University majoring in Human Development. In July of 2011 she Graduated with a Multiple Subject Teaching Credential and Master of Arts in Education and Digital Teaching and Learning. She enjoys education and regards it as a life’s pursuit. Her country voice, bubbly disposition, and love of life have set her apart and given her a unique sound that touches many. She loves bringing peace and joy to others through music and feels privileged to perform and share her testimony through song.